IExpenseOnline is web-based personal expense management software and budgeting software that you use online. IExpenseOnline is free, the interface is easy on the eyes and easy to use. If you do not want to put much time or effort into budgeting or tracking expenses, you may want to consider Mint or Quicken Online instead. But, if you find that tracking financial details helps with managing expenses, read on to learn more about IExpenseOnline. The Home page gives a quick financial overview with a weekly progress chart, and daily expenses and income lists. Jump Start icons provide one-click access to the Tracker, Charts, Tips and Plan-and-Targets features. 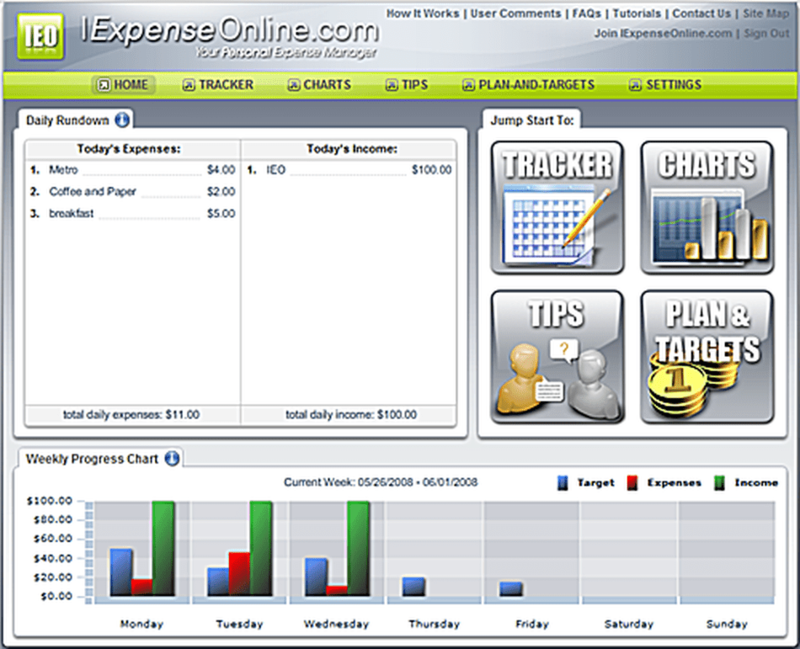 The Tracker is used to enter expenses and income. IExpenseOnline does not support split transactions, and it does not work with specific accounts although you assign an account type (credit, checking, etc.) to each transaction entered. IExpenseOnline Tracker also lets you prioritize expenses so you can see if you are overspending in areas that are less siginficant to your lifestyle. Tracker also includes an area for keeping notes, a calculator, tax estimator and currency converter. Recurring transactions are supported with Automated Income and Automated Expense features. IExpenseOnline Charts give good visual representation of spending habits. Line, bar, area and pie charts have a nice set of options for customizing by date and other criteria. Browse Tips for budgeting ideas, add your own money-saving tips, read and rank posted tips. Currently, most of the tips are simplistic but this area of IExpenseOnline has potential as more people add their own tips. Plans are three budget plans you can choose from, and Targets are savings goals you set up. Get started using IExpenseOnline without a plan, or use the Saver Plan to save for future goals over a specific time period, or use the Spender Plan to monitor maximum amounts you wish to spend in a given time frame. Links to Tutorials and How It Works at the top of each page provide graphically-rich help, and if you still have questions there is a Contact Us link at the top of each page. IExpenseOnline is free with the terms of service revealing that ads may be added to the site in the future. This is is acceptable considering that development and hosting software is not free. IExpenseOnline provides a guest account so you can navigate and use the software before signing up. No account numbers are entered in IExpenseOnline so there are no security concerns, but IExpenseOnline does not download transactions automatically. For those who do not mind entering data manually, this is a small trade-off. IExpenseOnline is comprehensive and ideal for those who want to track detailed expenses and for those who prefer graphics to reports with numbers.